With a long list of health benefits, Green Tea is well known for raising metabolism for weight loss and preventing and fighting cancer as well as other disease with its super antioxidants. Also used to regulate blood sugar and blood pressure, boost the immune system, prevent ulcers, control inflammation, viral colds and flu, prevents gum disease, cavities, and bad breath. Green Tea is also indicated for lowering cholesterol, preventing heart disease, osteoporosis and blood clots. Anti-viral, antioxidant, diuretic, expectorant, stimulant, stomachic, analgesic, astringent, cardiotonic, digestive, nervine, and carminative. 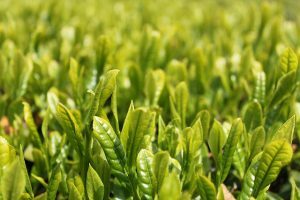 Chemical analysis has revealed that green tea contains significant amounts of water-soluble vitamins and minerals, particularly zinc, manganese, potassium, niacin, folic acid and vitamin C. In fact, one cup of green tea has more vitamin C than an orange. Researchers at the University of Kansas attributed green tea with 100 times the antioxidant strength of vitamin C, and 25 times that of Vitamin E. Green Tea has the antioxidant capacity of green tea is better than 22 various fruits and vegetables! Contraindications: Green tea contains caffeine and as such should not be used in large quantities while pregnant or nursing or by people who are not allowed caffeine.